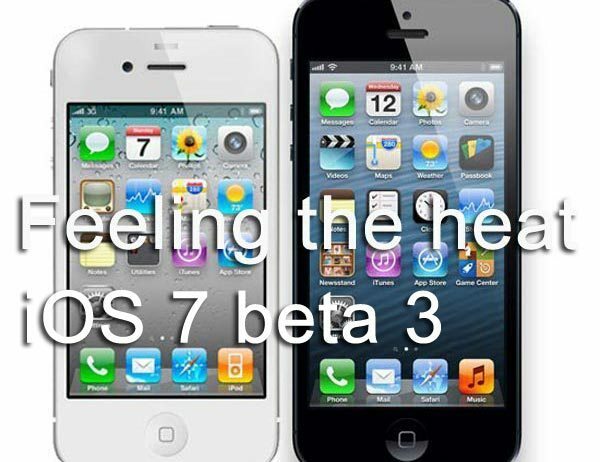 Today, we wanted to publish a quick update about the iPhone 5 and iPhone 4S running iOS 7 beta 3. This news comes via our in house developer, who has been using iOS 7 beta 3 on both the iPhone 4S and iPhone 5 with some problems being reported. First of all you should remember that iOS 7 is still in beta form, so issues are expected but we wanted to update our readers following both models feeling heat on iOS 7 beta 2. We published some details on this last week, and received a number of comments in relation to other people’s iPhones getting hot as well. iPhone 4S issues on iOS 7 beta 3 — sadly the overheating problems haven’t been fixed according to our apps developer, although they did note a big improvement for the iPhone 5 but this model didn’t experience issues on iOS 6, so that might be related. The iPhone 4S running iOS 7 beta 3 seems to get hot when using 3G, or other cellular data abilities but less hot when using Wi-Fi. We have also received comments and a couple of emails from our readers as well. One comment stated, “I’ve been using iOS 7 beta 3 since it went live and it’s hot, I mean HOT. My phone can fry an egg”. Another reader also added to this, “I updated to iOS 7 beta 3 right away and I’m still facing a heating issue and my iPhone 4S battery drains very fast”. It is worth noting that some people have been able to fix the iPhone 4S and iPhone 5 battery drain after performing a soft reset. You might also want to read our article that explains how to fix battery life problems on iOS 7, and this article includes information on iPhone 5 vs. 4S battery drain on beta 1. In a nutshell, you can fix the battery drain on iOS 7 by performing a clean install but make sure you back everything up first. This fix should also work with the iPhone 5, 4S and 4 running iOS 6 as well. If you are using iOS 7 beta 3 are you feeling the heat with iPhone 4S, also do you see the battery drain fast? We will test the clean install on our iPhone 4S experiencing battery life problems, and if this fixes it we will publish an update to this article. So far no glitches no overheating everything is working great on my 4s.but I have also been using wifi all day.I experienced all of the above issues with beta 2 including over heating,battery drain,keyboard stuck in landscape,apps randomly closing at start of the app,the phone just completely rebooting. These symptoms seemed to have been solved in beta 3 so far I have been using it all day.keep up the good work! I switched from android to iPhone from iOS 6 to iOS 7 right at a good time and I’m liking how fast things are coming together.still basic and simple to use and yet elegant. I’m using beta 3 on iphone 5 and the battery life is terrible! I had my phone unplugged for about an hour and it went down from 100 to 80%. I did not unlock my phone or do anything for it for another hour and it is down to 25% now. A few apps were open but nothing was being used. I don’t understand but I hate it. I haven’t noticed much overheating issues since the release two days ago and this is the first time I am having such bad battery problems. At least iMessage seems way more reliable than beta 2…. Is anyone else having troubles with wifi? I replaced a phone because the wifi was “greyed out”, and the new one is still doing the exact same thing. Iphone 4s iOs 7 beta 3 user. True, battery drains fast, gets hot, many apps glitches and from the time I upgraded to iOS 7, my phone shuts down twice and can not be opened for 12 hours to 1 day. Planning to restore iOS6.1.3. Differences in making the batteries for the iPhone 4S, iPod touch, and iPhone 5 (by individual manufacturer and ingredients used) have to do with this iOS 7 beta battery drain problem. My iphone 4s battery drains significantly faster now that I’ve installed the iOS 7. I switched off the screen & aprox half an hour later looked at it and 15% battery power had gone! (this is despite switching off notifications & updates for apps). It took one day for it to loose a full charge. I’ve also noticed that it’s taking longer to reach 100% when charging.